Welcome to my new vegetable garden. Over the coming season I will update this blog and explain what I’m doing, why, and tell you about the successes and problems I encounter. I have never had a garden of this size before, so it is something of a new journey for me too. The raised beds were already made and filled with soil before I took charge. I topped up the existing soil with horse manure, peastraw and compost and I let that mixture sit a while before planting into it. I added seaweed gathered from the beach to one of the three beds, the one that I have planted with tomatoes, peppers and cucumbers because seaweed adds the nutrients for growing flowers which turn to fruit. The second bed is for root vegetables, I have planted red onion seedlings, and sown carrot, beetroot and radish seeds, along with peas and cougettes, and the third bed is for leaf vege, silverbeet, lettuces and brassicas. Then I covered the beds 2 and 3 with birdnetting supported by fibreglass rods. Different length rods bent over the beds give different height framing. The netting will not only keep off birds but also domestic animals and hopefully white butterflies. When the seeds of carrot, beetroot and radish were taking a while to show through, I realised the top of the soil was drying out too much each day and this was compromising germination, so I covered the bed with shade cloth. This, I thought was successful in stopping the sun drying out the soil and scourching the delicate seedlings. It made a warmer environment too. 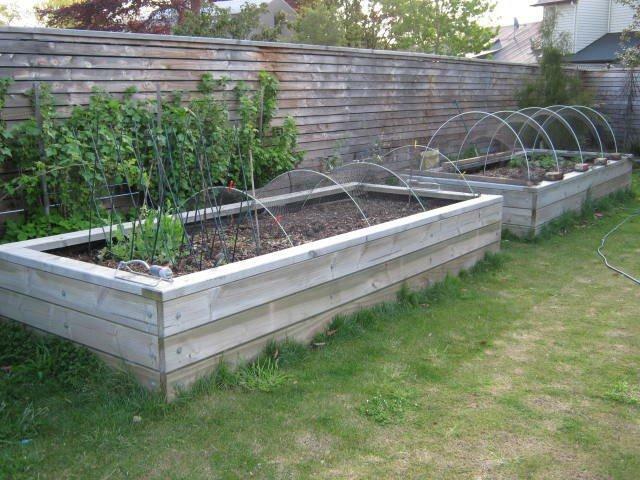 This entry was posted in Spring, Uncategorized, Vegetables and tagged fibreglass rods. Bookmark the permalink.